Can stereotypes help in international business development? If you've had a spouse for any length of time, you don't need an expert to tell you that conflicts arise - even among people who have a deep level of commitment and familiarity. If you've worked on more than a couple business deals, you know that the capricious nature of market transactions means that even well-grounded transactions can get sideways. And even rational folks with aligned, complimentary objectives can become irrationally misaligned. If you've occupied an airplane seat for more than six hours on a single flight, you've disembarked in different world where not only language, but also customs (cultural, not border crossing) and habits are different than yours. Just kidding, we won't go there. But there are some great stories to tell over a beer, chai, sake or whatever social drink prevails where you are. You see where we're going with this. On the one hand stereotypes and generalizations are toxic and ignorant. On the other hand they are incredibly helpful handrails to guide you through different experiences. The point is that each of us is simultaneously an individual, and a member of several cultural groups that contribute to how we view the world around us - and how we appear to others. But if we know that business can be tricky under the best of circumstances then it stands to reason that the addition of "hard wired" variables can complicate it enormously. So why do we tend to boil down our cross-cultural international business training to the proverbial business card presentation? Experience tells me that unless you live in an environment (really in it, not just located in the midst) for at least ten years you can't begin to approximate the intuitive understanding that comes with birth and upbringing. But if you are empathetic, judicious use of stereotypes can be an invaluable 'shorthand' tool for understanding cultural norms enough to facilitate your global business development efforts. You need to first understand your blind spots. For starters, check out the interesting self assessment on the @HarvardBiz blog from @BrandeisIBS professor Andy Molinsky (@andymolinsky) - also the source of the term "conscious incompetence" above, and author of Global Dexterity. With a foundational awareness of your ignorance, then you can better understand other cultural inclinations. To help with that, head to the great triangular continuum developed by Richard Lewis of www.CrossCulture.com. (shown above) Will it guide every international interaction you have? Of course not. Will some deals and relationships still fail? Of course. 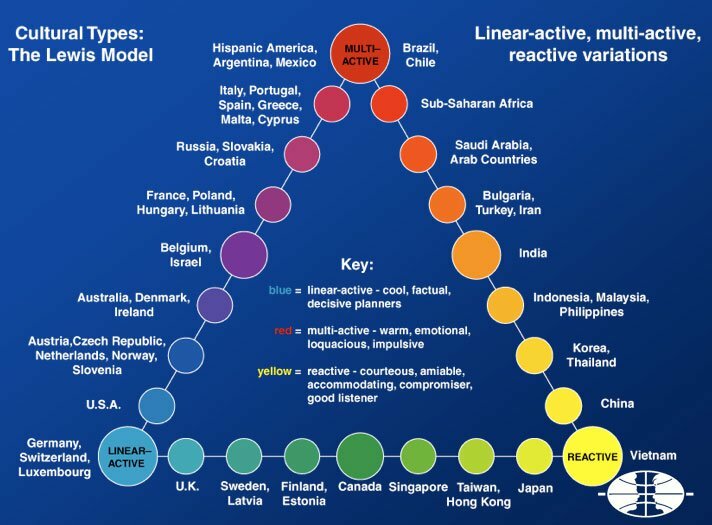 But want to understand the basic framework of how international cross cultural communications transpires? It's a great place to start. The bottom line? If you let "it" happen to you, it probably won't happen optimally. Similarly if you try to control "it", you'll likely achieve equally frustrating results. But strive to be empathetic and work within the predominant framework around you, and you'll find most folks appreciative and open. International business development success is attainable for SMBs, but starts with individuals with the right mindset and expertise. authors note - Although I am not acquainted with Professor Molinsky personally, I serve on the Advisory Board of Brandeis University's Rabb School of Graduate Professional Studies Virtual Team Management program.